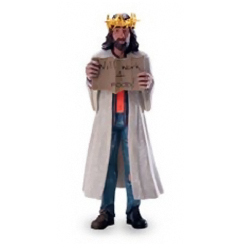 On the website Ship of Fools I was introduced to a new line of Jesus action figures by We are Fishermen . The Fishermen site is very well done, and it seems that the merchandise they produce is quality as well. According to the site, “Our Goal is to produce the most thought provoking, intriguing products that remind us of His eternal and enduring presence.” An admirable goal, but if you are going to provoke my brain to thinking then you’re just going to have to live with the consequences. An ancient writer once wrote, “Jesus Christ is the same yesterday and today and forever.” Uh… apparently not. Riding without a proper helmet is a fine punishable in most places. What message is this Jesus trying to send to our kids? Perhaps, this is the Jesus that went to the Temple and kicked some blessed assurance while clearing out the money lenders. With the right theme music it would make a pretty good movie scene. Cowboy up Jesus! I thought the good guy always wore a white cowboy hat? Seeing as Jesus is sporting his golden crown of thorns what would have been really awesome is if they had also represented the bull as golden. If we’re going to conflate two different eras why shouldn’t we throw in a third? 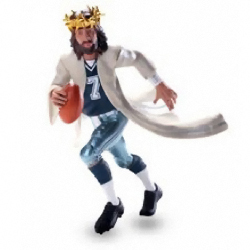 Your child will have hours of fun with his cowboy Jesus action figure as he dominates and subjugates the idols from the Old Testament. 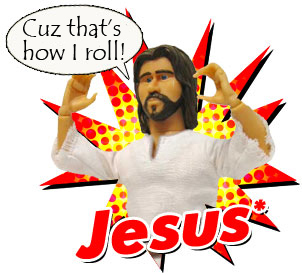 Cowboy Jesus also has some recorded phrases that can be activated with the push of a button. 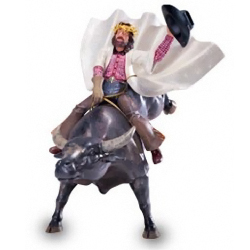 Instead of “Yee-haw” Cowboy Jesus yells “Yah-weh,” and says clever things such as, “I don’t accept the challenge, because there is no challenge, but I’d be more than happy to beat up on Baal some more.” Only one word can describe that toy: brilliant! 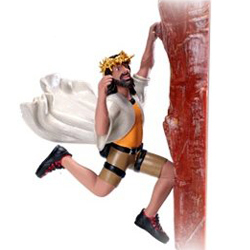 First off, I can’t figure out why Jesus is wearing Lara Croft’s shorts. Secondly, is the wind blowing up or is he falling down? Thirdly, I like my Son of Man less Metro. Ummm… I’m just going to leave this one alone. 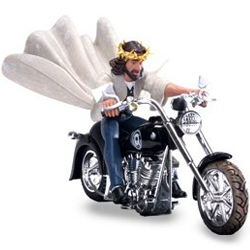 Jesus doesn’t need a helmet when he is blazing around on his motorcycle, but keeps it close by just in case the dove goes Old Testament on him. Apparently God is a Cowboys fan. I guess the only question is whether the King of Kings can play better ball than the Burger King. The title for this one is, “I am Youth.” Wow. Suddenly Motocross Jesus doesn’t look quite as lame. 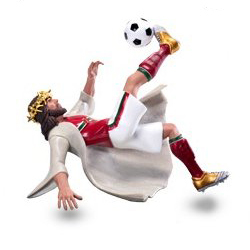 Jesus responding in a display of jealousy after everybody hails David Beckham as the “savior” of American soccer. 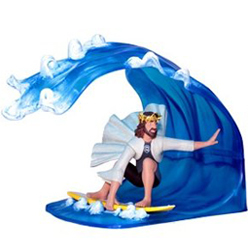 Of course, the biblical account would be a whole lot less impressive if Jesus had just surfed his way to the boat and Peter sank because he didn’t have a board. 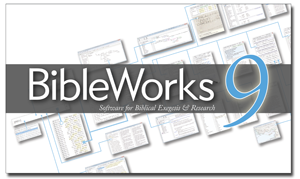 Puts a whole new spin on “I can do all things through Christ who strengthens me”! Hail Mary! I love it. so, is this a graven image? 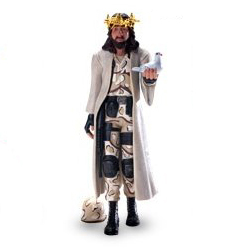 I think “Motocross Jesus” might be “Soldier Jesus”.. Incredible!! I just feel lack of brazilian/american fashion model “Jesus Copyright”… What? You never hear about him?? it’s very interesting! Until now i don’t understood wich’s from this guy; if he’s serious or not; but were published a photo in to São Paulo Fashion Week’s newspaper with this model dressing only underwear. At Youtube(and Google) also exists so much videos about him!! i think its an insult. jesus was not ment for this. but it does get people to talk about him. i hope in a good way though! ….and KAITLYN is a DOUCHEBAG!! 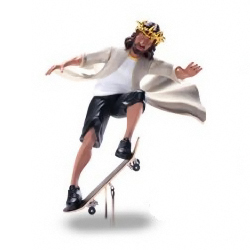 This is what we never got to see in all the traditional portrayals of Jesus: package. Bad to the Bone Jesus reminds me of Arny. “I’ll be back”. Yup – that’s what he said as well. Wow. We saw soccer and surfing Jesus at the 99 cent store. These are amazing.